[Updated June 3, 2013] With the budget vise tightening, top Pentagon managers are readying some potentially dramatic changes to the GPS constellation — changes that promise to lower both the cost of the satellites and the expense of putting them into orbit. The first changes would be subtle and are linked to buying the next block of GPS III satellites — a decision that sources confirm will be made by the end of September. To bring down the cost of the GPS III, which is widely viewed as unaffordable over the long run, the next contract likely will include satellite design alterations. The Pentagon will be looking to ditch capabilities that are no longer needed, a source explained, as long as it does not cost still more money. The Air Force has already said it will pursue dual-launch capability. The source said they are also considering easing some of the equipment standards. “They’re building to certain standards and those standards are probably going to be relaxed, which makes a difference in costs,” said the source. The savings come from being able to reduce the testing of the redundancy and lifetime of particular items. Program managers are also weighing reducing the system integrity requirement in light of information that the Federal Aviation Administration (FAA) would require decades of test data before deciding whether the system met its strict integrity standards. When the Air Force met with the FAA, the source said, the aviation officials told them that even if the Air Force was broadcasting at 10-7 today, the earliest they would make a decision about using it was 2050. The Air Force has determined that an integrity of 10-5 was sufficient for its purposes, the source said, which leaves open the question of spending the extra money to achieve a higher integrity level that would not be fully relied upon for years, if ever. Settling for 10-5 would permit the Air Force to drop using laser cross-links and go back to radio-based cross-links. The next contract will cover at least three GPS III satellites, said the source, who spoke on condition of anonymity, though it is not clear what the delivery dates will be. As reported earlier by Inside GNSS, the anticipated useful lives of the earlier GPS spacecraft were officially estimated upward earlier this year — which enables the launch schedulers to stretch things out a bit. The real changes could come when the Air Force decides what to do after the next contract is signed. Momentum is building to shift to a new constellation architecture that uses two types of GPS satellites — full-capability GPS III satellites that form the core of the system and new lean spacecraft called NavSats that complete the system’s geometry. Incorporating small satellites would not only fill gaps, they could potentially save enough money to make it possible to maintain the constellation at some 30 satellites, improving the coverage to the point that users in even the most mountainous terrain or dense urban canyons would be able to get good signals. One version of the concept is described in a report delivered to Congress in April. The document, entitled Lower Cost Solution for Providing Global Position System (GPS) Capability, walks through a variety of options ranging from making no changes to the GPS program to adding geosynchronous satellites and even having an all small-sat constellation. As envisioned, the NavSat spacecraft would have only navigation payloads and could potentially be launched two at a time. They would not carry the Nuclear Detonation Detection System payload (NDS) found on the full-up GPS III satellites. NDS is a capability that requires so much additional power and shielding that one expert estimated it adds some $200 million to the cost of a GPS satellite once the launch is taken into account. To further reduce the weight and power requirements, the Air Force is considering having only four signals on the small sats — two civil and two military — and possibly using digital waveform generators to be able to switch over to a different signal if needed. The number of redundant clocks and mission processors might be reduced along with the shielding. New technology could further reduce costs. It would be possible, for example, to shave the power requirements by using traveling wave tube amplifiers (TWTAs or TWEEtas) and solid state amplifiers. There are also radiation hardening improvements, more efficient solar arrays and longer lasting batteries, according to the report. Further power savings could be found by changing the specification for the power received by the user to be measured at an elevation angle of 20 degrees instead of the current 5 degrees. After studying the tradeoffs the Air Force found that the best choice was a constellation with a core of dual-launched GPS III satellites complemented by NavSats in at least 20 percent of the orbital slots. This combination was cited as one of the best for providing the greatest availability of accurate signals. NavSats are broadly similar to the Spartan sats discussed last year and to NibbleSats – a concept proposed by Brad Parkinson, former head of the first NavStar GPS Joint Program Office and Vice Chair of the National Space-Based Positioning, Navigation, and Timing (PNT) Advisory Board. “The idea is that if you have a problem that looks pretty insurmountable sometimes it is worthwhile to simply convert it over to a series of nibbles — and then, at the end of the day — try to figure out if you are where you would like to be,” Parkinson told the members of the PNT Advisory Board at a May meeting in Washington. With 33 satellites the number of minutes of outages per day that are experience by a sky-impaired user is negligible, Parkinson explained, even with two satellites not functioning and a masking angle of 45 degrees — that is when the user can only see satellites at or higher than 45 degrees above the horizon. With only 24 satellites in the constellation a user would typically experience outages of nearly two hours daily, even if all the spacecraft were working flawlessly. With two satellites out, the signal outage jumps to as much as five hours. “If you go to the mountains of Afghanistan, you will see [masking angles of] 60 degrees in many cases.” At that masking angle, Parkinson said, the outages jump to more than six hours a day with only a 24-satellite constellation. With 33 satellites, no outages occur until you lose a satellite or two — and those outages last about an hour or less. The question is how can the United States afford to build and maintain the 30+ satellite constellation needed for this level of service. Although the GPS constellation is about that size now, the current commitment from the Air Force is for only 24 satellites. Experts have long been concerned that budget pressures will force a shrinkage in the existing overpopulated configuration. “Expensive satellites are both hard to sustain politically and from the standpoint of managing a process that has intermittent ins and outs” Parkinson said. Parkinson suggested a constellation of 15 to 18 “full-up satellites” — GPS IIIs, for example – and an additional 15–18 NibbleSats, small satellites with all the signals but nothing else extra except the now-planned laser reflector. To afford such a constellation you “nibble at the satellites weight, complexity and power — and that hopefully directly drives the manufacturing cost down — and, because the size went down, it enables a triple or quadruple launch or perhaps an inexpensive single-satellite booster of the type we are now starting to see,” he said. The power reductions in turn reduce the heat with which the satellites have to cope. With the current design, said Parkinson, “somewhere on the satellite it has to radiate about a kilowatt out into space. It means surface area. It means heat pipes. It means a number of other things. We know how to do it; it’s just adding weight and complexity.” The NibbleSat, he estimated, would have well under a third of the heat rejection requirement. These technologies plus other developments, such as lithium batteries and more efficient state-of-the-art solar panels, would make it possible, Parkinson argued, to slash the cost of a navigation satellite from its current $450 million on-orbit price tag to as little as $110 million, if four at a time were launched. That could cut costs to the point that a larger 30-satellite constellation incorporating 12 NibbleSats would cost $1 billion less than a constellation made up entirely of 24 GPS IIIA spacecraft. The idea of using a bevy of austere small satellites to augment fully equipped spacecraft has been around for a least a decade, one expert pointed out. This time, however, it might get off the ground. The Air Force has already gotten industry involved via a Broad Area Announcement, the report said, firms that could help support the development of the concept. Space and Missile Command is also already teaming with the Air Force Research Laboratory to investigate “a prototype demonstration program” to be launched in the 2018 timeframe. “The program could implement an aggressive goal to productize the payloads and develop NavSats that save 30 to 60 percent when compared to the cost of a GPS III satellite,” the report said. But the results of any research will not be available for some time and a determination needs to be made soon on how to proceed with GPS III. 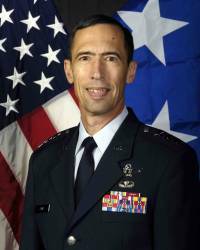 Gen. William L. Shelton, commander of Air Force Space Command, is facing a tough decision, noted another source, because the satellites they decide to buy, or not buy, in September will be in place for years.